Register now for NOHRC 2016 and take advantage of our competitive pricing. 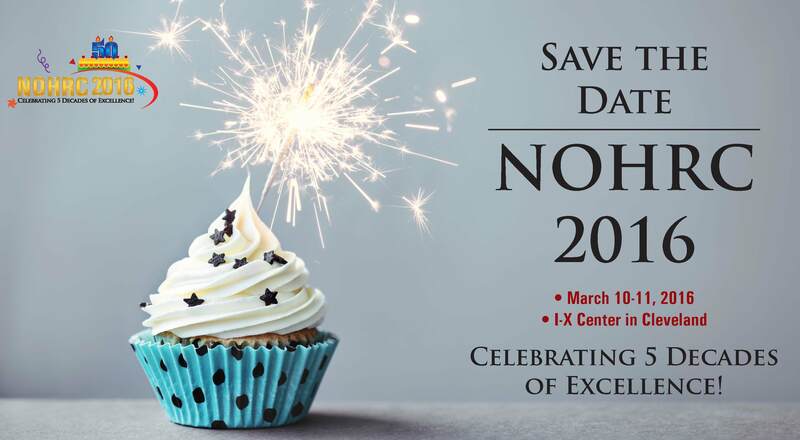 NOHRC 2016 is celebrating its 50th birthday with a 2 day conference event! We’re offering three registration options this year: Both Thursday and Friday (March 10 & 11); Thursday (March 10) only or Friday (March 11) only. Members of Ohio-based SHRM chapters and National SHRM Members are eligible for discounted member rates! NOHRC 2016 • Celebrating 5 Decades of Excellence! Visit www.nohrc.org or call the NOHRC hotline at 440-940-6534 with questions. Register NOW for 2013 NOHRC! Networking Opportunities - With 500+ HR professionals! Recertification Credits - Earn HRCI credits for PHR and SPHR recertification - including those hard-to-get strategic management credits! NOHRC 2013 has been pre-approved for 5.5 General Credits, of which 3.25 credits are considered Strategic by the HR Certification Institute (HRCI)! Quality Speakers - Listen and learn from HR experts including a dynamic opening session, luncheon keynote, and closing power session speakers, as well as 10 concurrent sessions. Please visit the NOHRC website at http://www.nohrc.org/schedule.cfm for the schedule of events. Jim Knight: Opening the conference will be Jim Knight. Jim is the former head of global training & development for Hard Rock International. He will leverage great brands as a platform to discuss key strategies to build a rock star team. Learn more about Jim by clicking HERE or view Jim's video about how excited he is to speak at NOHRC. Philip Solomon & Dan Thurmon: Philip Solomon and Dan Thurmon are the luncheon session speakers. They will present “Rhythms of Success,” a highly entertaining keynote presentation that will teach you how to build and strengthen your most vital relationships. Philip and Dan created a video for NOHRC as well - click HERE to view. Chip Madera: Closing the conference is Chip Madera. Chip's topic is "How to Be an HR Rock Star." Let Chip show you how to be a ROCK STAR in your organization! Also, be sure to catch ERC's own Susan Pyles! The Exhibit Hall - In the market for new HR products/services? There will be nearly 90 exhibitors for you to visit. Bookstore - Staffed by Horizontal Books, the bookstore will allow you to shop for books, CDs and other materials, as well as host speaker book signings.